"Ajith" -A man who came to the cinema industry without any background. But with his self confidence ,today he is having one of the largest fan following in K-Town & Producers are waiting for his call sheet.All these things doesn't happened in a single day.Ajith touched both the extremes. In his twenty years of cinema , he achieved tremendous success when he was an upcoming actor & attain painful failures when he is at the peak of stardom.I just want to discuss his "Roller coaster journey of his 20 years with numerous ups & downs". "Amaravathi"-the first Tamil Film for Ajith, the film is not a great success but for a newcomer one must say it is quite a good start & His acting was appreciated and brought lot of offers but there is a word called "Fate" which came into his life through a accident and made him to be in bed for one and half years.Truly one must that is a great blow for an upcoming actor,though he acted as a hero in first film due to the void generated by the one and half year accident he have to act in small roles in "Pavithra","Pasamalargal(with Aravind swamy)","Rajavin parvailey(with his friend & competitor Vijay). Even in "Aasai" I won't say his role is prominent because the entire story revolves around Subalakshmi & prakashraj but his acting is well praised by the media and needles to say his Female fan following increased because of his smart look in Aasai & even now "Aasai nayagan Ajith" tag line is very much popular . But one must say the turning point in his carrier happened in the name of "Kadhal Kottai" and with a such a heart touching love story and charming look his female fan following doubled.Kadhal Kottai is a commercial success and even it attained cult status when the film bagged a National award for the director "Agathiyan". From then on there is no set back for Ajith of course there are some average grossers & flops like Ullasam,Thodrum but he got lot of offers and delivered Hit films like "Kadhal Mannan","Aval Varuvala","Unnai thedi". The film which took Ajith to the next level is Vaali,the film proved that Ajith can act in any kind of role. Dheena is the film which gave a big boost to his stardom,The "Thala" title is just started with this film. Needless to say the film is one of the biggest blockbuster in his carrier, then came "Citizen" ,the film is not a great success but critics praised Ajith as a actor who can pull any kind of role with an ease & I still remember one of the critic wrote "After Kamalhassan Ajith's face suit for any kind of Make-up,Even Poovellam un vasam was a moderate success. But the failure came through "Red" & "Raja" and he immediately made a comeback through "Villain" directed By KS Ravikumar,But Ajith failed to keep the success rate & some of his interview like "I'm the Number 1" earned him bad name in Industry. The string of failure started with "Ennai Thallata varuvala" ,"Ajaneya",Jana","Ji" ,"Thirupathi". Attagasam & Paramasivam are some of the average grosser for Ajith at that time.one must say these failures made him more matured and a humble human being that he is now. He again made a tremendous comeback through KS Ravikumar's Varlaru & again there is a huge appreciation for the variation he showed in the 3 roles, Particularly in the "Feminine"character even the so called Ajith haters liked his role.But Aalwar repeats the failure history again & Kireedam was a average grosser. Billa is really a dream comeback for Ajith,there are many question raised like "How Ajith can reprise the role of Rajinikanth but Ajith played the role in his own style and the film is one of the biggest blockbuster for Ajith.Then came "Aegan" - a average grosser but Asal is a failure. I must say that "Mankatha" is the film that redefined Ajith's Image.He did a role which cannot be performed by an actor who is having a great stardom,But Billa2 doesn't generated any buzz except a great opening. 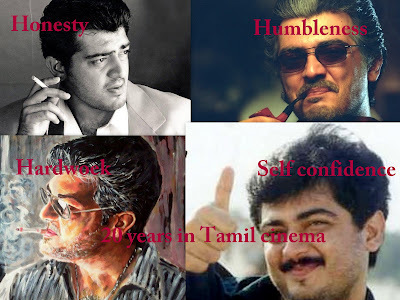 Everyone Knows that Ajith is a good actor but why Success is not travelling continuously with him? saran said in an recent interview (Suhasini's Autograph)When Ajith accept "Kadhal mannan" he didn't heard the story,he believed saran because he is from KB sir & since it is his first film , Ajith thought that Saran will do his best.I too accept that his ideology worked well in "Dheena" and "Vaali" in which AR Murugadoss & SJ Suryah are newcomers, but one should not forget Red,Anjaneya,Jana,Azhwar,Ennai Thalata Varuvala which almost ruined his carrier. As a film lover I just noticed Ajith has less number of Family Audience but this could be changed if he work with director like shankar,KV Anand,Goutham menon ,AR Murugadoss and of course he can give chance to the directors who are coming up with a good script & not to the new directors who are trying to taste success with his stardom. Ajith says "A good film doesn't need Advertisement",I agree with his view but today his film budget is not within 20 crores and his salary is nearing 20 crores,If he team up with good director surely the budget will be more than 60 crore and without a strong promotion one cannot make more money in reality,Ajith please do change your ideology even Rajinkanth gave an interview and participated in the Promotion of "Endhiran". youth are his strength. That's why his film get bumper opening. After that his films didn't do big business.